- Everything will be more orderly. - Unlike the old version, now you can modify the data and update them instantly without having to reopen the program. - The data will remain even if you close the program, this will make you avoid putting everything again the next time you open it. - It is advisable not to modify anything in the config.ini, do it through the program, thanks. 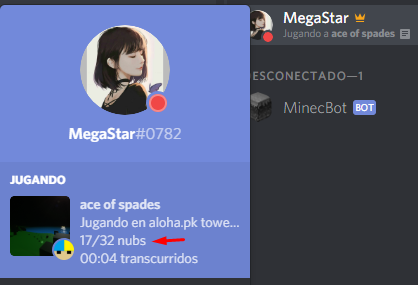 This time I come to share a Rich Presence that I did today in relation to ace of spades for Discord, you can customize it to your liking. Once downloaded the file, watch this video, here I show all the necessary steps. This script allows you to detect possible evading players, this is verified through the player's IP ranges, this also verify through the country, city, ISP and region. This detection starting from 3 ranges of pairs of numbers (x.x.x.o) (obviously). In this case there are 3 ranges of similarity, which would be: 193.33.144, the same happens if this find 2 ranges of similarity. In 3 ranges or 2, the matches of Country, city, ISP and region may vary. This command is used to see the data of both IP, the range of matches will also be shown. This would be better if a bot did it in the IRC, so we can verify more easily if a player is evader through the country/isp/city/region, this will give us more precision even if both IPs do not match. I will do it when I have time, thanks. The servers for default will always save the data of the bans in the file bans.txt, it does not matter if the IP of the player is banned again, the new ban will be saved causing the accumulation of bans with repeated IPs, I don't like this. Seeing this, I decided to modify the code a little so that you can choose whether to let the new ban accumulateor that the old bans of that IP are eliminated leaving only the current ban (only if that IP has been previously banned). If the option to accumulate the bans is enabled, this script will automatically get only the bans that did not expire leaving aside those that have already expired and still remain in the bans.txt, this will also get the ban with the longest if a IP was banned more than 1 time. That said, the purpose of the script is to obtain the data of a specific ban, you can search it through an IP or nick. This is my new build script, it's improved and now it can work without problem with any other script such as box, paint, floor, db, dw, wall, etc. This new version contains registration and login to protect and save the sectors of each user, with this we avoid the grief and trolls users who want to cover or destroy the sectors with box, floor, db, etc. Here is the account name of the user, it will never be repeated or there will be another like it. Here will be stored users who can destroy and build in a player's sector. Here is the account password of the user. Here the IP of the user is saved, with this we avoid that more than one account is created. This command allows you to register on the server, you need to put the name of your account and password. This command allows you to enter your account, you need to enter the username of your account and your password. This command allows you to share your sector with another user, you need to place the account name of that user, keep in mind that he will be able to destroy and build in your sector. This command allows you to remove a user from your list of users who can build and destroy in your sector, you need to place the account name of that user. This command will teleport you to your sector. This command allows you to claim a sector, you can only claim 1. This command allows you to exit your account. This command can only be used by administrators, you need to place account name of that user to whom you want to remove their sector. Users will not be able to build or destroy anywhere until they register, login and claim a sector. - Only administrators can build and destroy on the entire map without having to register, be careful with this. - It does not matter if a user has /god, he can only build and destroy in his sector (also in the sectors where he was given the permission to destroy and build). - Use a auto savemap script like savemap.py, with this we avoid that some constructions are lost in case your server closes. - Put a message in your config.txt saying that to build you need to register, login and claim a sector. - Download the build.py file and put it inside your scripts folder. - Download the users.json file and put it inside your dist folder. - If you change the size of the claim (RANGE_CLAIM) avoid that it is not so big. In the video I registered with two accounts to show how the script works but this only be done once. This script may be helpful, the purpose of this command is to make it easier to ban a player during a certain time, usually the "/ban" command takes the "time" through the minutes, so 1 day will be " 1440 ", 2 months would be" 87600 ", 1 week" 10080 "etc. - When a player is banned, the script will send a message to all administrators saying that the "player" has just been banned by "name of the admin/guard/etc" for "duration of the ban" with the reason of "reason of the ban"
"MegaStar was banned by MoDeR for 2 months with the reason of: for being cool"
- Nick of the banned player. - IP of the banned player. - Reason why he was banned. - The day and time he was banned. - Nick of the admin/mod/guard/etc that gave ban him. - For how long was he banned. - For default I have put it in False. - The /mban command can only be used within the game. Any questions you have, just put your question on this topic, thank you. - Once you challenge a player, that player will receive a message saying that you are challenging them. - When you want to accept a versus, you must put /accept <player> (example: /accept #1), when you accept the challenge, all the players that are in the server will automatically join the spectator team at the exception of you and the challenger. - Those who are in the spectator team will not be able to join any team and will not be able to use the /versus or /accept commands until the versus is over. "The versus (your nick) and (nick of the challenger) have started!" "The player who reaches (maximum kills to win the versus) kills is the winner!" "Goal of versus: (maximum kills to win the versus) kills!" "(nick of the winner) is the winner!" - When finishing the versus again the team's will be unblocked and it will be possible to start again a new versus. - When a player, whether you or the challenger, leaves while the versus has not ended, a message will be sent saying that the Versus has not ended for the reason that the (player) retired while the Versus had not yet finished and everything will be unblocked again so the players can choose a new versus again. - The players will not be able to kill, destroy and build, all this will be enabled only when a versus has started therefore only the players of that current "versus" will be able to build, destroy and kill, everything will be disabled when the versus has finished. Perfect maps for this game mode, they would be assault and pinpoint, you can also use small maps. There is a glitch in which is that you can destroy unbreakable blocks (I will not say how it is done) but in this script that glitch/bug does not work. /sector: If you are far from your sector and want to teleport to your sector, just use this command. /ask <player> <question (optional)>: Ask the player if you can destroy their blocks. /allow <player>: Allow a player to destroy your blocks. /remove <player>: Revoke the player's permission so that he can no longer destroy your blocks. How to use it: You must put the command /claim and choose the place where you want to have your sector, if you want to choose the color of your sector you should only change the color of the block you have, once you have chosen the place and the color only you should hit the block that is at your feet. -The claim will not work if you choose a sector that is in the range of another sector, you must ecoger a good sector. -If any player has permission to destroy your blocks (/allow), anyway he will not be able to place or destroy any block in your sector since the sector is only for you but he can break your blocks that are outside your sector. therefore the sector size per player will be 30x30 blocks (cimetric base). How to use it: You must put the command /sector and you will automatically teleport to your sector, this can be useful if you are in another place and want to return quickly to your sector. -This command will allow you to remove the sector of a player, keep in mind that when removing the sector of a player, that player can choose a sector again. -If the <player> does not have any sector, the command will not run and the script will send you a message saying "the player (player name) does not currently have a sector." -This command can only be used by administrators. -If the sector of the <player> is removed successfully, that sector will count as null, therefore they will be able to build and destroy since the sector will not exist. -If nothing is passed in <question> the default question will be "can I destroy your blocks?". -When the command is used, the <player> will receive that message and decide if he will let you destroy his blocks. -If the <player> currently already has permission to destroy your blocks, the script will send you a message saying "The player currently has the permission to destroy your blocks." -When a player asks you something with /ask, to accept it you only have to put /allow <player name or #ID> and automatically the player can destroy your blocks. -This command will allow you to remove the privilege to a player who previously you gave him the permission (/allow) to destroy your blocks. -If the <player> currently does not have permission to destroy your blocks, the script will send you a message saying "The player (player name) can not currently destroy your blocks." -You can not claim more than 1 sector. -When you choosing a sector, the area of ​​the sector will be painted with color of the block you are using. -The weapons, grenades and spade do not cause damage. -Grenades can not destroy blocks. I modify some scripts a bit, so they can work with this script. -The sculpt.py script will only allow you to destroy the blocks of the map, yours and those of your sector, if a player gave you permission to destroy their blocks (/allow), you can also destroy their blocks with the sculpt. -I recommend that the commands: /box, /db, /df, /dw and /wall should only be used by the players that are trustworthy to you, this will avoid the misuse of commands. -I will put the map I am using in the video (the map is great for a build server) along with the scripts + a config.txt that you can use it on your build server, you just have to change the passwords. The commands /paint, /rapid /gr(gradient commands) and /sculpt can be used by any player. This script will allow you to modify the damage of the weapons, both the damage it causes to the head, body and arms/legs. The commands /riflevalue, /smgvalue and /shotgunvalue will have 3 parameters, in <value head> you must put the damage you want the weapon to do in the head, in <value body> you must put the damage you want the weapon to do in the body and in <value arms/legs> you must put the damage you want the weapon to do on arms/legs. If you only want to change the damage of the head, you must only pass the damage in <value head>, the other parameters will automatically take the value that the weapon currently has. in case you want to change only the damage of the body, in <value head> you should pass the value 0 and then put in <value body> the value you want, it will no longer be necessary to pass the value of <value arms/legs> since it will automatically take the value it currently has in arms/legs. In case you want to just change the damage of <value arms/legs> you must pass both in <value head> and <value body> the value 0, and in <value arms/legs> you must pass the value you want to put. If you want to reset the damage of the weapons to the default value, you should only put /debug command. In the case of the shotgun, each shot have 8 bullets, therefore each of those 8 bullets will take the value you put, in the video in /shotgunvalue I put 1 in <head value> therefore 8 bullets in the head is equal to -8HP. This script allows players to buy things for their own benefit. Refill: Restores your hp, grenades, blocks and ammo at 100%. Shield: Counts like a bulletproof vest, the damage of weapons will makes you less damage, when you buy 1 shield the durability of your bulletproof vest goes up to 200%, the bulletproof vest does not last forever, every shot you get in the body will lower the durability of your bulletproof vest, if the durability reaches 0% it will send you a message saying "Your shield has been broken!" and the damage of the weapons return to normal. The maximum durability is 400%, be careful because this only protects your body, if someone shot you in the head the damage of the weapon returns to normal. Your shield will continue to work until the durability reaches 0%. /m = if you have medkit's you can use this command. /get [object] = if no object is passed, the script sends you a message saying the things available to buy. If the object does't exist, the script send you a message saying "the [object] was not found on the maket." + the things available to buy. /mystuff = to see everything you have bought and currently have: amount of dollars, helmet's, medkit's and The durability of your bulletproof vest (shield). To get dollars, you must kill 1 player, since 1 kill += 1 dollar. I come to share another script that may be of help, the purpose of this script is to help detect evaders. The script works with the "bans.txt" file that is inside the dist folder. example: 104.166.78.57 (104 is a, 166 is b, 78 is c, 57 is d). suppose that a banned IP is 192.168.120.89 and the IP of the player who has just entered your server is 192.168.120.50 (here would be "Ban Evader Detected" since both IP's contain 3 equal octets 192.168.120). Now let's suppose that another banned IP is 120.233.45.100 and the IP of the player that has just entered your server is 120.233.80.20 (here would be "Possible Ban Evader Detected" since both IP's contain 2 equal octets 120.233). The script will alert you with a message in the IRC when it detects an evader, as well as sending a message to the administrators who are inside the server.